Is there a connection between food and inflammation in your body? Is your diet and the food you are eating keeping you in pain? Are you always feeling horrible and simply can’t figure out why? 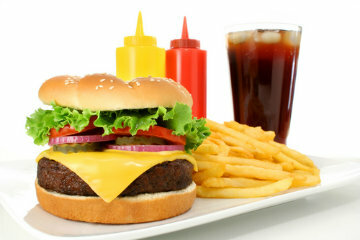 Are you always going out for fast food and can’t seem to get out of the vicious cycle? When you hear the word inflammation, it’s likely to bring to your mind thoughts of painful joints and muscles, swelling, and a loss of mobility. Did you know that recent research shows that chronic inflammation in your body can lead to serious diseases such as diabetes, heart disease, some cancers, and Alzheimer’s disease – just to name just a few? The amount of inflammation in your body varies and is dependent on a number of factors, including: your activity level, the amount of sleep you get, the degree of stress in your life, and even the foods you eat. What you have to realize is that these factors are cumulative – meaning they build up over time. And the more that any or all of these factors get out of whack, the risk for disease increases. Early in life, these levels can be so low that you might not even be aware that you have any inflammation in your body. That’s because our bodies do a fairly decent job of controlling the inflammation – at least for a while. Then one day you wake up and you’re in your 40s and something is just not right. That’s when the fear begins to set in, and you think to yourself: ‘What did I do wrong?’ or ‘What can I do now to help myself’? The first step is to get your C-reactive protein (CRP) levels tested. C-reactive protein is produced by the liver, and the level of CRP rises when there is systemic inflammation in the body. Ask your doctor about this (you may have to demand to have the test done). All it requires is a blood sample that will be evaluated by your doctor. And because diet can play a large role in how much or how little inflammation you have, you may want these levels looked at by a registered dietician who can help you formulate an appropriate eating plan. If you think there may be a connection with food and inflammation in your body but you’re not quite ready to change your diet, you may choose to take the traditional medical path, which includes non-steroidal anti-inflammatory drugs (NSAIDs), steroids, and even joint-replacement surgery in extreme cases. However, the good news is that there are natural ways to fight inflammation without the undesirable side-effects that often result from the treatments listed above. For more information on how your diet can change your outlook on life and increase your quality of life, please read more about by clicking Dietary Choices and pain: Are the foods you eat keeping you in pain?